Tranmere have completed the signing of Nigeria striker Enoch Showunmi on a two-year deal. 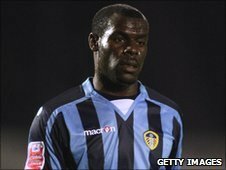 Showunmi, 28, spent the second half of last season in the Scottish Premier League with Falkirk and has also played for Luton, Bristol City and Leeds. Rovers manager Les Parry said: "I'm really pleased to be able to bring Enoch to the club. "He's a powerful striker who will bring something different to the players we've already got at the club." Parry added: "He's excellent at bringing teammates into play and comfortable on the ball, and he will be a great addition to our squad." Showunmi is the fourth new arrival at Prenton Park this summer following the signings of Joss Labadie, Tim Cathalina and Gunnar Nielsen.